Winter is a time of New Year and Christmas holidays, a mysterious time when dreams come true, miracles happen everywhere, and fantasy becomes a reality. Feel like a hero of a New Year’s story, sinking into incredible adventures, and overcoming the most challenging obstacles. Enter into a New Year stronger: pass a shaky hanging bridges, ride a bike or skateboard on the rope stretched at a five meters height, and enjoy an unforgettable flight at zip line. New experiences and interesting promotions and discounts in the adventure parks by SkyPark are waiting for their brave visitors both young and adults who are seeking to meet New 2017, having overcome their fear of heights. Warm pants that don’t hinder your movements during crossing the trails in SkyPark adventure park. Because you’ll have to squat, to hoist the legs and even to do the splits. Mid-length jackets, not to let them coming out from under the safety belt system when moving, while overcoming obstacles in SkyPark adventure Park. Comfortable shoes with flexible soles that will allow you to be sustainable on various treils of adventure park. Beanies without pompons. In every adventure park by SkyPark you’ll wear a helmet, and inappropriate headwear may interfere with your comfort. Crochet/knitted gloves, tightly fitting the hand and fingers in which you will be able to hold belay system on the trails of adventure park. Do not wear long scarves and other wardrobe items that could get caught in the elements of obstacles during your visit an adventure park. We are waiting for you daily from 10:00 am to 7:30 pm. See you in the SkyPark adventure parks! 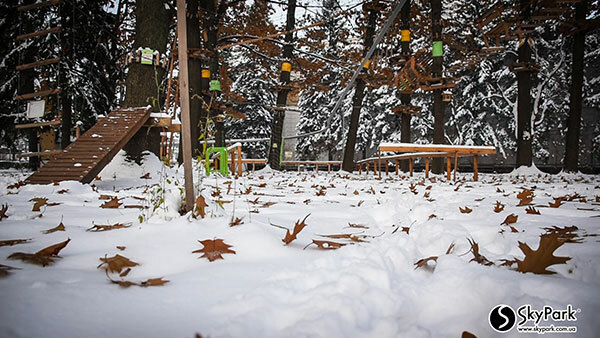 Since 2008 the SkyPark company has been engaged in production and development of rope attractions and sports-and-entertainment adventure parks in Ukraine. We constantly improve our technologies, follow the latest innovations in equipment for rope rides and make our visitors happy with new impressive entertainment.